Barcelona firm Derbi's name showed its roots, DERivados de BIcicletus meaning "derivative of bicycles" - which is what they had built until the 250cc Super was released in 1950. Early motorcycles included a 350cc twin but in the 1960s Derbi concentrated on small-capacity bikies such as the racy 49cc and 74cc Grand Sports. The firm's successful challenge in Grand Prix racing's smaller classes culminated in Angel Nieto winning five 50cc and 125cc world titles between 1969 and 1972, when Derbi pulled out to concentrate on road bikes and motocross. Over a decade later the firm returned to Grand Prix to win a string of titles with another legendary Spanish rider, Jorge "Aspar" Martinez. Derbi motorcycle history. 1968 Derbi Antorcha The Antorcha was Derbi's first forray into the 49cc market back in 1968 and production of this model was continued at a max rate of 147 per day up until 1971 so as rarity goes there are very few of them left now. 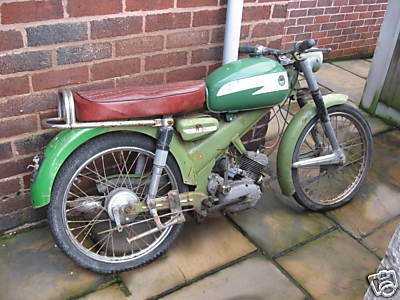 This bike is the actual introductory model and still bears most of its original decals stating 1968 etc.